I define Brand as a perception—generated by the aggregate customer experiences across all touch-points and covering the entire customer lifecycle. Social media is just one customer-facing touch-point; there are other channels to deliver the numerous touch-point experiences. Real data generated from our work with clients and research on the global credit card customer experience, the global mobile communications customer experience, the global city visiting experience, and the global B2B purchasing experience is used to introduce the concept of ‘Branding by Total Customer Experience (TCE)’. This data illustrates how social media fits in the big picture of the TCE model, by each touch-point experience and by each functional area. What is the TCE (Total Customer Experience) Model? Figure 1 illustrates a pragmatic view based on our work with a client (a global financial institution) and our global research. For confidentiality, the TCE model and the data shown in Figure 1 are disguised and simplified for ease of explanation and understanding. The importance level of each touch-point / channel in driving customer retention and the NPS (Net Promoter Scores) are identified. Stars denote the touch-points that are important to retention and NPS, squares are important to retention only, circles are important to NPS only, while triangles are unimportant to both retention and NPS. 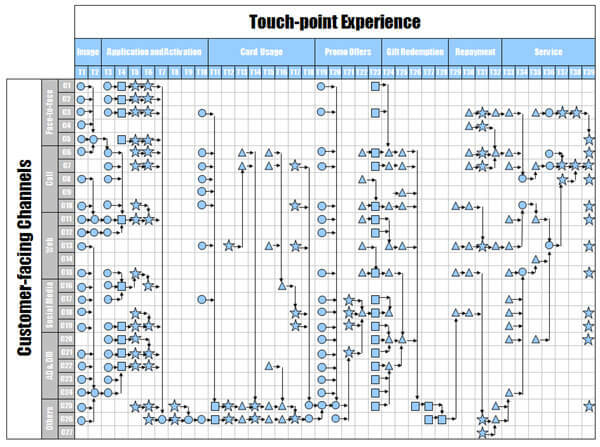 A TCE model is an integrated and quantifiable management system based on our patent-pending CEM methodologies, to map the total customer experience across all touch-points throughout the entire customer lifecycle, as various channels and functions within or outside an organization deliver the experience. This is a truly outside-in approach, as the mapping sequence, selection of touch-points, and channel identification are customer-centered and not company- or process-centric. Figure 1 is a perfect example showing how social media fits in a TCE model for a credit card issuing bank. Along with other customer-facing channels, social media is positioned to deliver a touch-point experience. Similar to other channels, such as the channel Call which can have sub-channels such as in-bound, out-bound, IVR, agent, SMS, etc., social media is composed of several sub-channels, denoted by C16, C17, C18, and C19 in the simplified model. These might be Facebook, LinkedIn, Twitter, or MySpace, and each of them might be further broken down into public spaces or the company’s network. When we map and relate each sub-channel with each touch-point experience, we have a fully integrated view of social media in the credit card customers’ entire lifecycle; in other words, we put social media under one roof. Who owns social media? Of course, the correct answer is your customers. But in the real business environment, somebody inside the organization has to take care of this new and important channel. Whether it is an ‘extension’ of each function – for example, adding a company tweeter within the service department to handle customer complaints or setting up a new dedicated team to manage all related social media activities – chaos and silos are often the outcome as neither approach provides a clear view of what others are doing. These extensions usually end up creating more silos and difficulties in communications and workflows. At the firm of our client, a global financial services provider, the marketing department takes the lead in building a TCE model and coordinating all relevant departments and functions for touch-point mapping and model development. This is the first time that each function or department of their organization can see how they influence the total customer experience and how they interact with other functions or departments in delivering a specific touch-point experience. Though politically they still have many hurdles to overcome, conceptually, visually, and strategically they are moving towards becoming a single entity servicing their customers. Putting social media under one roof migrates organizations from un-integrated silos to integration with a ‘One Team’ approach. “Show me the money.” Whenever you ask for a budget to support your customer experience or social media initiatives, this is what your boss or CFO would like to say to you. In general nowadays, I think no one will deny the importance of social media in influencing a firm’s reputation and operations. The key is understanding how much money should be invested and how to justify this spending. It’s about the ROI. Unless you are in the minority who are lucky enough to have top management buy-in already, you cannot get the support you need if you don’t have a business case. There are always better ways and better approaches competing to achieve company targets. All companies have limited resources, especially in a slow economy. An increase in spending on social media means the reduction of resources allocated to other touch-points and channels. A struggle among functions to go after a limited budget is the natural outcome. How you justify your spending or even gain more support from your management for social media is about more than painting a beautiful picture with empty promises. A quantifiable approach supported by strong numerical assumptions aligned with business results is the perfect way to go. Putting social media under one roof justifies and optimizes resource allocation for social media. We have another client who is a regional market leader in mobile network operations. Their CEO doesn’t buy in to an increase in spending on social media. The main objectives of this mobile network operator in the coming twelve months are to retain their most valuable customers and to improve their brand differentiation in the market. When we align these defined business objectives to the TCE model for specific target customer segments, the subjective arguments about social media budget are replaced by objective outcomes and data generated from the customers’ voices during the multiple touch-point experiences – what we call X-VOC, Voice-of-Customer @ Experience. Businessmen, especially top management, are practical people. They agree with you if you demonstrate and, at the same time quantify, how your proposed investment in a specific social media strategy and its execution aligns with and helps to achieve business results. Things get much easier when you talk to them using a quantifiable approach. We should aim to win the war, not just the battles. Excelling in some touch-points means you are winning some battles, it doesn’t mean you are winning the war – delivering an experience which helps you to achieve your business objectives effectively. Pick the right fights. Pick fights that are crucial to leading to victory. There are so many social media; you will drown in the sea of social media and exhaust your resources and yourself, if you don’t create a comprehensive picture. How can you manage the total customer experience before you have a full view of what it covers? One of our clients is responsible for the online business of their B2B customers. They invested a lot in user experience initiatives to ensure their corporate customers are happy at all online touch-point experiences and to drive them to invest more money in their bank to enhance positive word-of-mouth. However, the outcome is only to provide a ‘me-too’ homogeneous experience; almost all their competitors are doing the same thing and deploying the same user experience practices in serving their customers. Everything is more complicated with the emergence of social media as a new touch-point. The TCE model grants them a new perspective – they now look at the forest, rather than just the trees. And most importantly, they have a new strategy and execution plan to drive sales and WOM by reallocating resources from the least important to the most important touch-points, which, of course, include numerous social media. Putting social media under one roof aligns the strategy and execution of social media with corporate objectives. Successful brand management is much more than just advertising or marketing. You need to jump out of the conventional branding and marketing silos to get a broader and more pragmatic perspective. As David Ogilvy said, “Products are built in factories, brands are built in the mind.” Brand is a perception, generated by the aggregate customer experience across all touch-points and covering the entire customer lifecycle. Of course, social media, as one of the critical channels, have their role and impact how your customers perceive your brand. In 2010, we completed a global survey of the city visiting experience in ten cities: Amsterdam, Dubai, Hong Kong, London, New York City, Paris, Shanghai, Singapore, Sydney, and Tokyo. We built the TCE model, which covers the entire visitors’ touch-point experience including city image, pre-arrival, arrival, city, people, enjoyment and departure as delivered by various customer-facing functions. In this case, some touch-points are managed by commercial organizations and some are government departments or related entities. Not surprisingly, social media plays a very important role in word-of-mouth, which is one of the most important attributes influencing respondents to visit a city for the first time and to come back again. A highly ‘branded’ city like Paris is not built by advertising or some particular touch-point the visitors experience. It is affected by the outcomes of the whole visitor experience across all touch-points and covering the entire visitor lifecycle. Brand is in our mind and is a perception. You see, branding is created by the Total Customer Experience. Putting social media under one roof nurtures your brand using a quantifiable management system. This is much more than a touch-point mapping exercise. When you build the model; when you derive the importance levels of various touch-points in achieving your target objectives; when you assess their performance levels – you develop the dashboard, KPIs and measurement metrics and put up a permanent system for continuous monitoring and enhancement. Don’t get me wrong; TCE only gives you a bird’s-eye view. It is the top-level architecture. You won’t be able to deliver a branded and effective experience until you also build the low-level architecture; you need to derive the emotion curve of those critical touch-points delivered by specific channels or functions. It is the TCE model that guides you to focus on those touch-points, which are important in achieving your target objectives, whether they are acquisition, retention, or growth.